Definition: Robert Blake and Jane Mouton have developed the Managerial Grid, also called as a leadership grid. According to them, the leadership styles can be identified on the basis of manager’s concern for people and production. Here, concern for people means the degree to which an individual is committed towards the goal achievement, maintaining self-esteem to workers and satisfying interpersonal relationships. Whereas, the concern for production means an attitude of superiors towards the quality of procedures and policies, creativeness of research, effectiveness of staff, work efficiency and volume of output. In the figure, there are 81 possible categories where the leader’s style may fall. Impoverished Management (1,1): The managers with this leadership style exert minimum effort to get the work done by the subordinates. They have minimal concern for both the people and production, and they function merely to preserve their jobs and seniority. Therefore, the disharmony, dissatisfaction, disorganization arises within the organization. Task Management (9,1): Here, the leader is more concerned with the production and lay less emphasis on the personal needs of his subordinates. This leadership style is also called as a dictatorial or perish style, where the subordinates are required to perform the task as directed by the superiors. In this leadership style, the output in the short run may increase drastically, but due to stringent rules and procedures, there could be a high labor turnover. Middle of the Road (5,5): The manager with this style tries to keep a balance between the organizational goals and the personal needs of his subordinates. Here, the leader focuses on an adequate performance through a balance between the work requirements and satisfactory morale. Both the people and production needs are not completely met, and thus the organization land up to an average performance. Country Club (1,9): Here, the leader lays more emphasis on the personal needs of the subordinates and give less attention to the output. The manager adopts this style of leadership with the intent to have a friendly and comfortable working environment for the subordinates, who gets self-motivated and work harder on their own. But however, less attention to the production can adversely affect the work goals and may lead to the unsatisfactory results. Team Management (9,9): According to Blake and Mouton, it is the most effective leadership style wherein the leader takes both people and production hand in hand. This style is based on McGregor’s Theory Y, where the employees are believed to be committed towards the goal achievement and need not require manager’s intervention at every step.The leader with this style feels that empowerment, trust, respect, commitment helps in nurturing the team relationships, which ultimately results in the increased employee satisfaction and overall production of the organization. 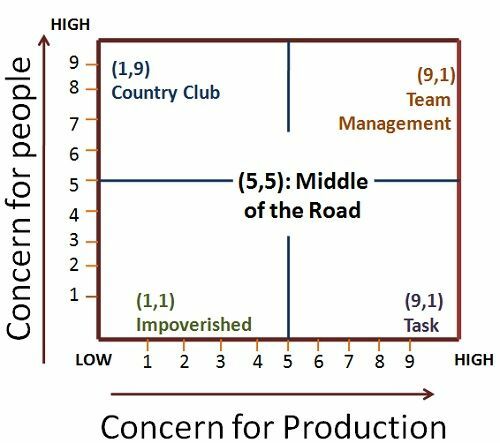 Thus, the managerial grid is a graphical representation of different leadership styles that manager adopts while dealing in the industrial settings.